If your waste bins and recycling containers are giving off unpleasant odors, SOS Odours has the product you need: BAC-500. BAC-500 is an odor neutralizer specially designed for waste odors from various containers. It is an effective cleaner for residential garbage bins, and it eliminates impregnated odors at the same time. BAC-500 is ready to use and needs no special preparation. 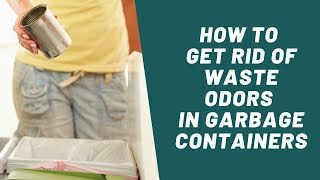 How to Neutralize Odors in Outdoor Garbage Containers? First, we recommend rinsing the container/bin to remove any excess residue in the bottom. Spray BAC-500 over the entire inside surface of the container, including the lid. Wash the inside of the container using a brush. Rinse with clean water. Spray inside the container again so the odor neutralizer can penetrate the plastic. In the summer when odors can be stronger, repeat as required.